Shown: KLAW HPU in ship-to-ship transfer environment. A completely independent hydraulic power unit for ERC activation, the HPU offers the operator a single point of control over the emergency system. This means the ERC can be activated for other reasons or emergencies beyond stress on the hose line. There are many control variables that can be integrated into the HPU system including automated options. The HPU can operate a single ERC or a system of up to 10 ERCs. 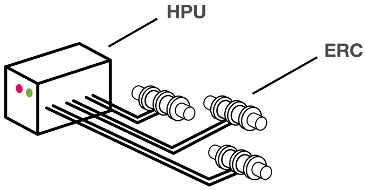 Shown is a conceptual illustration of HPU controlling Emergency Release Couplings. 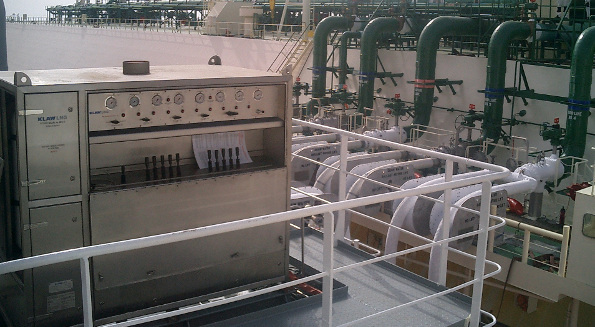 The HPU can be hydraulic, pneumatic or electric and the system is controlled using a Connection Control Panel (CCP). The system can be provided to SIL1 or SIL2 compliance.